A bar tram, a cocktail tram, a party tram: you take care of the catering and we will make sure you get the right vehicle. The different routes we have on offer will allow you to come up with a trip that suits your needs. Additionally, you can rent our museum halls for different kinds of events. Our Museum or parts of it can be rented for family parties, receptions and various shows or corporate events. 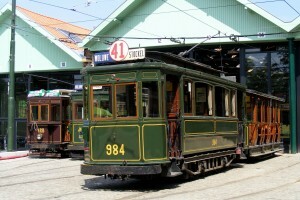 • the “Tramways Bruxellois” hall, separated from the Museum but with a view of our collection. It can hold approximately 40 people. • the “carpet space”, a dedicated and modular space in one of our halls. This formula is ideal for groups up to 250 people. • the “Guy Cudell” hall, a complete museum hall that allows for larger events like walking dinners. It holds up to 600 people. Our rental department will gladly help you to find the formula that best suits your needs. If you’re looking for a trip with a vintage vehicle without the restrictions of a tram, we have just the thing for you! 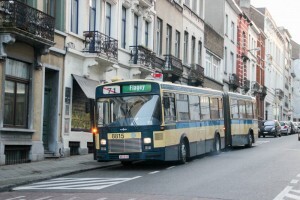 One of our old-school buses can take you on a tour of Brussels and its periphery. Feel free to contact us to plan your trip! This is a vehicle that is at the same time spacious, modern and comfortable. It is the right choice for people who aren't specifically looking for the vintage feel of our older buses. Despite its reduced seating capacity, bus 8060's seventies style upholstery and (comfortable) interior will surely win over your guests. This bus is equipped with a sound system as well as a refrigerator. This relatively modern bus can accommodate a large number of passengers. 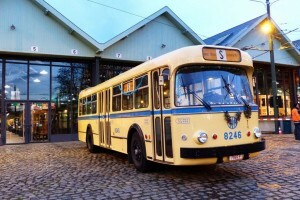 This "Brossel" bus is an icon of Brussels in the 1960s. 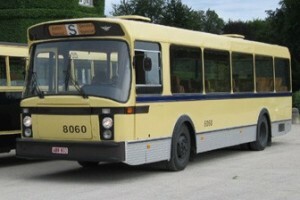 After its career with STIB, it served many schools and municipalities well for a number of years. A charming trip through the beautiful Sonian Forest. This journey is ideal for the summer months which allow for “Belle Epoque” motor cars and trailers. However, we can also offer more modern, larger vehicles with outside doors and heating. • from € 400 to € 530 depending on the time of year and the day of the week. 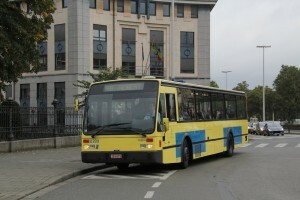 This basic price includes either a one hour waiting time in Tervuren or a visit to the Museum. 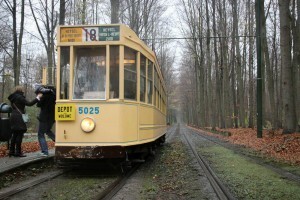 This "Belle Epoque" tram can take you on a trip through the Sonian Forest, to Tervuren. 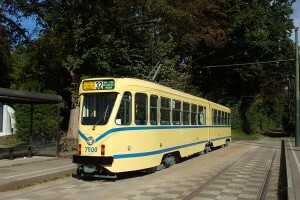 If coupled with an open trailer ("baladeuse") it can transport groups of up to about 40 people. 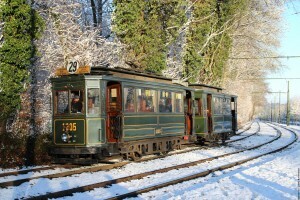 With its classic woodwork and its "Art Deco" touches, this tram with open platforms is ideal for a trip on our heritage line through the Sonian Forest. It accommodates up to about 30 people. 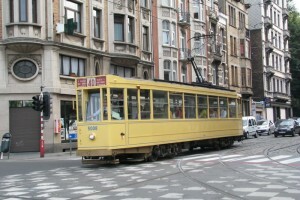 This vehicle was an integral part of the Brussels streetscape for 40 years. It's ideal for groups of up to about 20 people. However, it can be coupled with a trailer (from the same period): this doubles its capacity to 40 passengers. 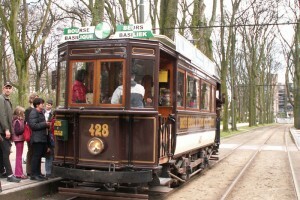 This typical "Belle Epoque" tram can take you on a trip through the Sonian Forest, to Tervuren. If coupled with an open trailer ("baladeuse") it can transport groups of up to about 40 people. 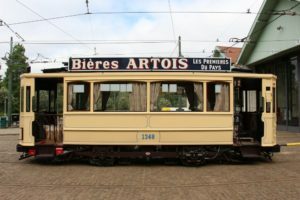 This charming "chocolate coloured tram" is ideal for short trips with about 20 people, to either Tervuren or Cinquantenaire Park. This relatively short trip takes you on a tour of the sights of Ixelles, Etterbeek and, of course, Boitsfort, a particularly leafy area of Brussels. 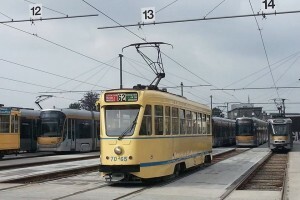 These comfortable trams had a very long career in Brussels, stretching from the early 1950s to 2010. They can accommodate up to approximately 50 people. 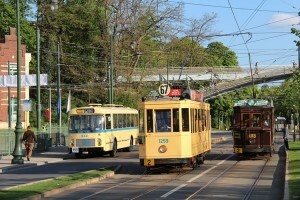 These spacious and comfortable trams are ideal for longer journeys through the city. They can accommodate about 30 (seated) passengers. Certain trams of the 5000 series have an on-board sound system. If the short tour of Boitsfort is too short for you, we have an extension on offer that takes you through the beautiful residential neighbourhoods of Avenue Brugmann and Avenue Churchill. This is the ideal journey for groups that wish to discover some of Brussels’ finest monuments: Cinquantenaire Park, the Palace of Justice, the Town Hall, the Royal Palace and the Parliament buildings. The beautiful train station at Schaerbeek is definitely worth a detour, for an extension to our journey to the Royal Quarter. This additional half hour makes the trip even more worthwhile! You would like to see more of Brussels besides the Royal Quarter and Avenue Louise? We have another extension on offer that takes you through the university neighbourhood, leafy Boitsfort and the Boulevard du Souverain. You would like to see more of Brussels besides the Royal Quarter and Avenue Louise? We have another extension on offer that takes you through affluent Uccle, leafy Boitsfort and the Boulevard du Souverain. A marvellous trip through the green southern parts of the city. You will get to see beautiful “Art Nouveau” mansions in Etterbeek, Ixelles and Uccle, as well as affluent neighbourhoods around Saint-Job and Fort-Jaco. A slightly longer and equally marvellous trip through the green southern part of Brussels. 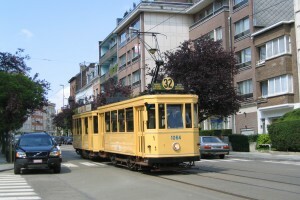 Besides the “Art Nouveau” mansions you will get to see in Etterbeek, Ixelles and Uccle, you will also pass through the university neighbourhood as well as leafy Boitsfort. This trip includes a lot of Brussels’ must-sees! 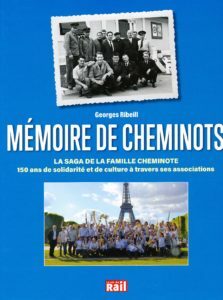 Our destination is the Heysel Plateau, the location of the Atomium. We also ride through beautiful areas of Ixelles and Saint-Gilles, the area surrounding Avenue Louise, the Royal Quarter, the Brussels-Charleroi canal, Midi station, Barrière de Saint-Gilles and leafy Boulevard du Souverain.